Thirty animals were added in spring 1999, but instead of fur were covered in brillant enamel. These are the animals that bring Sue's Wildlife Carousel to life. For generations, young and old alike have been enchanted by the nostalgic beauty and magical charm of the carousel. Open daily from 10 a.m. - 4 p.m. weather permitting. 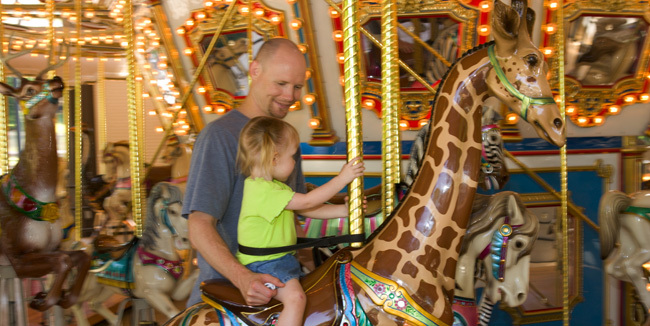 All rides will not operate if there is rain, snow, ice or if the temperature will not reach 50 degrees by 1 p.m. You must be at least 42 inches tall to ride Sue's Wildlife Carousel without an adult.